Whats going on in Cornwall in June? The Season of course. 5th June – Jubilee Tuesday. Bunting, pizzas and sparkle in the NY shop. 7th,8th,9th June – The Royal Cornwall Show – without doubt the finest county show. The RCS is Cornwall’s biggest and best-attended event. It is the best place to catch up with all the friends, see the enormous tractors, talk bees (we came third in the newcomer honey class last year), prize bulls, bizarre guinea pigs, the flower tent and of course you have to end the day with watching the Interhunt Relay. And if you haven’t seen the Interhunt Relay on Thursday evening in the main ring, you don’t know what entertainment is. 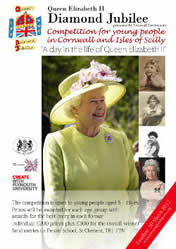 9th June – The Royal Cornwall Museum opens its newly re-furbished gallery. 15th-17 June – The Sea Shanty festival in Falmouth. Your chance to hear the famous Fisherman’s Friend, and to shout your head off to well known songs like Lamorna and Trelawney. You do know the words to Trelawney don’t you? And to REALLY give Henley Regatta and Wimbledon a run for their money we have the FIRST J Class regatta in the UK since the re-birth of the class. Cowes, eat your heart out. 26th – 30th J-Class Regatta Falmouth.